Travel Oregon inspires visitors to travel to and within its beautiful state. Designing a site that would bring the wonders of Oregon to life. The new website needed to capture their mobile audience and feature their stunning photography and whimsical new brand in an ADA accessible way. But most importantly, the site needed to inspire visitors to experience the wonder of Oregon for themselves. As the strategy and creative lead, I embraced these challenges. To ensure a seamless experience across devices, I designed the site first for mobile. User research suggested that a robust navigation would decrease site performance, so the user experience features a streamlined navigation. Page templates are designed to offer continuity for users, but flexibility for content editors. The new website had to bring to life the magic that makes Oregon so unique, so I incorporated whimsy into the design at every level. To draw users in, the homepage hero displays various photos of locations all around Oregon. In an effort to immediately orient individuals to the state, the hero text includes the time of day in Oregon and a friendly greeting. Additionally, throughout the design there are whimsical details like hand-drawn icons and skylines overlays of real locations within Oregon. And if you know morse code, you’ll be able to spot the word ‘Oregon’ in the dotted divider lines. 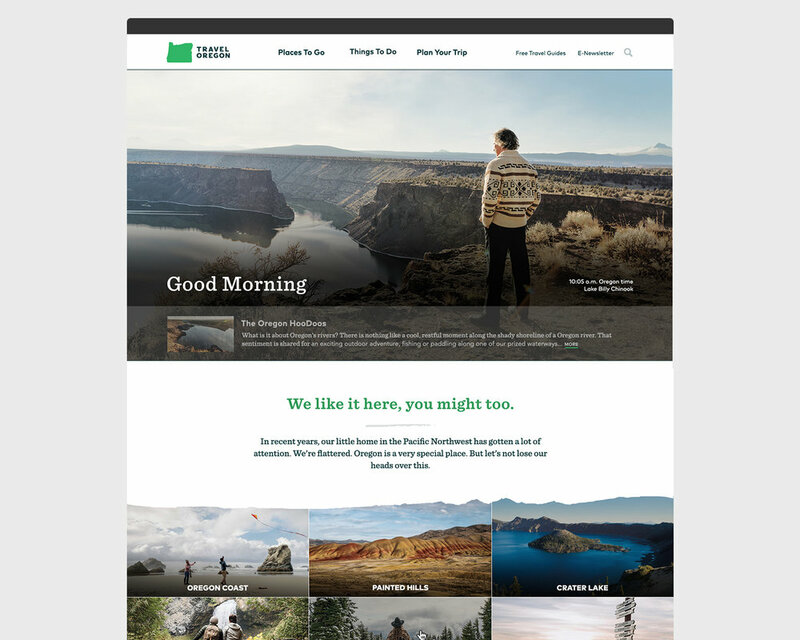 After launch, Travel Oregon’s new site received national attention. In 2018, the site was a Webby Award Honoree and a finalist for an ESTO Mercury Award. Mobile-first wireframes ensured each template satisfied and achieved user goals. Travel Oregon is a ThinkShout client.